For many of us, Prom night is one of the most exciting nights of our young lives. Not only is it the end of our school careers and our last chance to say a fond farewell to those we have known for so long, it’s also a chance to shop for the perfect look with friends and share a night getting ready and having a great time together for what may be the last time. With that in mind, we want to get our outfit’s just right. Cue the inspirational Prom looks! Long ball gowns aren’t for everybody, and they don’t need to be with gorgeous shorter options like this available. 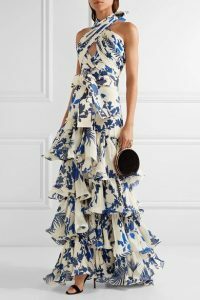 The high-low hem and the off the shoulder neckline keeps the dress interesting whilst the sumptuous, champagne colored silk fabric ensures that this is no ordinary summer dress. If a dramatic, full-length ball gown most certainly is your style, you won’t find one with much more drama than this. The stunning sheer fabric on the floor length full skirt is classic and very romantic. The open front is tastefully done and allows the focus of the dress to be mainly on the stunning skirt. Another shorter option here. The top layer of white lace on this dress is absolutely stunning, certainly an option for those who love a particularly feminine look. The long sleeves and high neckline also mean that the shorter skirt looks tasteful and elegant. 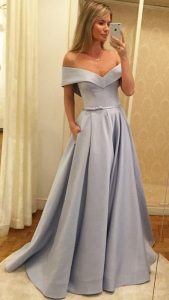 This dress would be perfect with your hair up or down and as it’s all one color, you can easily add pastel colored accessories to lift your finished look. Who says we have to wear a dress to prom? Not us! If dresses are just not your thang, no problem! There are plenty of other options for you to try out that are dressy, without being an actual dress. Try something like this gorgeous jumpsuit. The dark green color and the fabric are still in-keeping with a prom dress code but the trousers mean you can move around comfortably and freely. Here’s a dress option with a difference. Why not mix up the classic prom gown look and go for a two piece top and skirt instead. Classic attire, with a little-added twist. Perfect for spring and summer proms as it’s a little cooler than a full dress. The crisp white top on this particular outfit also perfectly offsets the brighter colors in the skirt. If you love the idea of a two piece but the skirt length is an issue, simply try a shorter skirt instead. Just make sure the top has a high neckline to balance out the short skirt. We love this particular outfit with it’s embroidered top and the matching waistband on the skirt, it’s absolutely adorable! We love a bodycon dress, they’re super beautiful and a great way to show off your gorgeous figure. We especially love the way the lace on this particular dress is layered over the top, giving it an extra dressy element that’s perfect for this time of year. 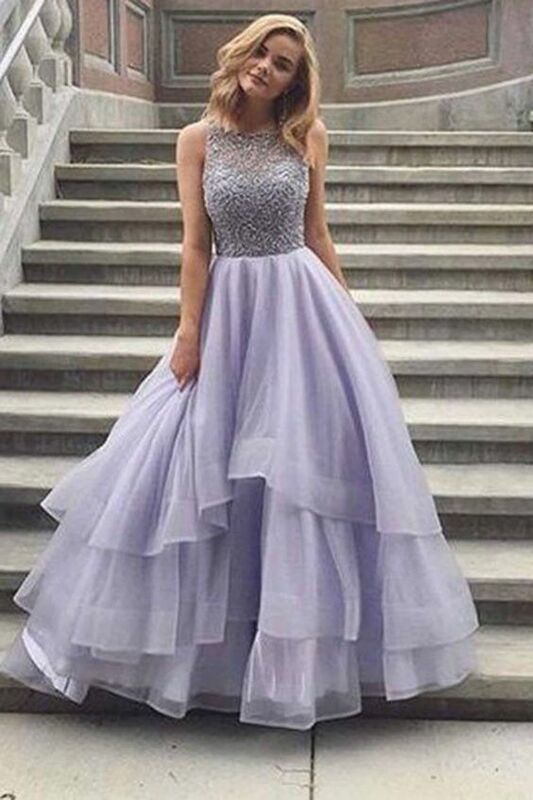 The pastel color is also a lovely option for a springtime prom. This beaded dress is incredibly sophisticated, not to mention the intricacy of the top paired with the more simple floor length skirt is a match made in heaven. This is a really beautiful option for prom as the cut and color of the dress is absolutely timeless. This off the shoulder gown is giving us some serious Sleeping Beauty vibes, and we love it. Although it doesn’t intermittently change color from pink to blue (sadly), the classic off the shoulder straps and stroke-able silky fabric are truly dreamy. You’ll feel like an absolute princess in a dress like this, as so you should for your prom. The floral embroidery on the train of this dress is perfectly positioned to make a statement but also doesn’t steal away from the dramatic shape of the dress itself. Great for those who want a little wow factor for their outfit. The tutu-like skirt and silky pastel pink fabric on this dress will have you feeling like a beautiful ballerina as soon as you zip it up. A perfectly pretty look for prom. For all of the Boho fashion lovers out there, this one is for you. Try this with some strappy heels or flats and a flower crown for a truly bohemian prom look. Maybe even try some natural looking waves in your hair to go with it. Lovers of all things floral will be hard pressed to find a gown more gorgeous than this. The sophisticated deep V-neck teamed with the ultra-feminine floral pattern are a match made in prom heaven. Love your pins but still want to wear a full-length gown? Go for something like this, you get all the drama of the long skirt with the wow factor of a shorter dress. If you live your life in jeans and casual trousers but you want to make a little extra effort for prom, why not rock a killer pantsuit for the big night?! Pop on a pair of heels and you’ll be just as dressed up as everyone else but feel more like yourself. Okay, this sequin jumpsuit is too beautiful for words. Who even needs a gown when you can attend your prom in a stunning statement outfit like this one. Going to prom doesn’t necessarily mean you have to wear an elaborate gown. If you prefer something casual or you don’t want to spend heaps of money on something new, wear a dress you already own, many of us have a plain skater dress knocking around somewhere. Wear something that makes you comfortable and jazz it up with a new pair of shoes or a colored clutch bag. Spring and summer time is the perfect time for floral wrap dresses. And there’s no reason you can’t wear one to prom. Especially if it’s as cute as this one! You may be thinking a shorter dress won’t be a striking as a traditional gown. Selecting a bold color like this purple will ensure you have a dressy appearance for Prom whilst still being able to fit in and out of the toilet cubicle without assistance! Prom is a night for photographs and farewells, it’s also a night for hitting the dance floor! You can make sure you’re ready to move by wearing a more casual jumpsuit. A more casual option here, and perfect for a low key prom look. 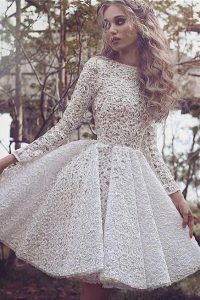 This dress is beautiful and a wonderful option for those who just want to throw on a comfortable dress but still feel special. The emerald green color of this dress is super striking and suits pretty much all hair colors. 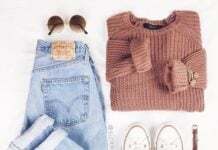 Try something like this if you’re all about the colors in your usual outfits. 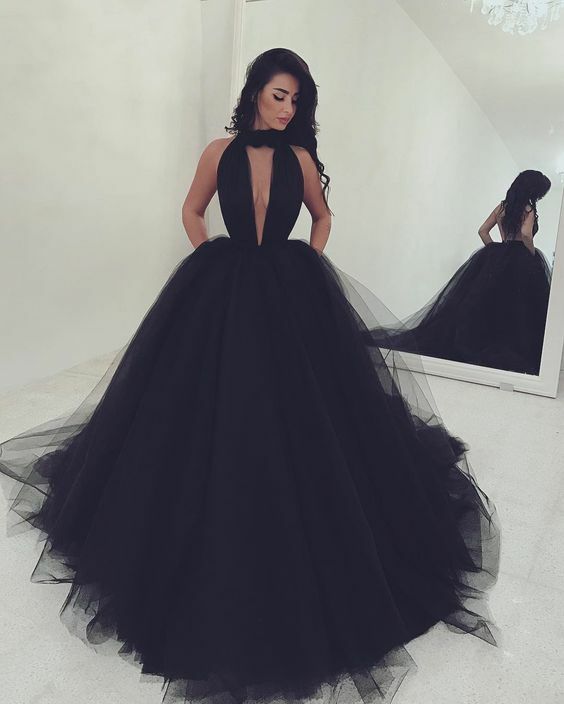 A tiered gown can be a scary thought for those of us with curves, however, you may actually find that a dress like this is surprisingly flattering if you give it a chance! For those with a more slender frame, a ruffled dress such as this one is great for adding some shape and oomph to a Prom look. 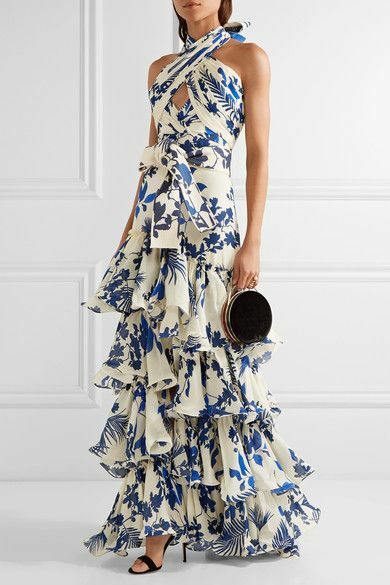 Wearing your hair down can look a little fussy with the ruffles on a dress like this so opt for an updo to let the focus of your look be on your stunning gown. Perhaps you don’t want to wear a dress at all, and that’s okay! Why not try on a fitted tuxedo like this lovely blue velvet one. You may be surprised how much you love it. You’ll be the “Belle” of the ball in this Disney-esk yellow gown. Best suited to brunettes, this color gown will make a sensational statement. Shine like the star you are in a floor-length dress with a beautiful print of stars in the night sky. The silver sparkles against the sheer black fabric are truly beautiful! A classic look for prom is this beautiful, floor-length red silk dress. It may be plain and simple, it’s also totally striking and a stunning color. 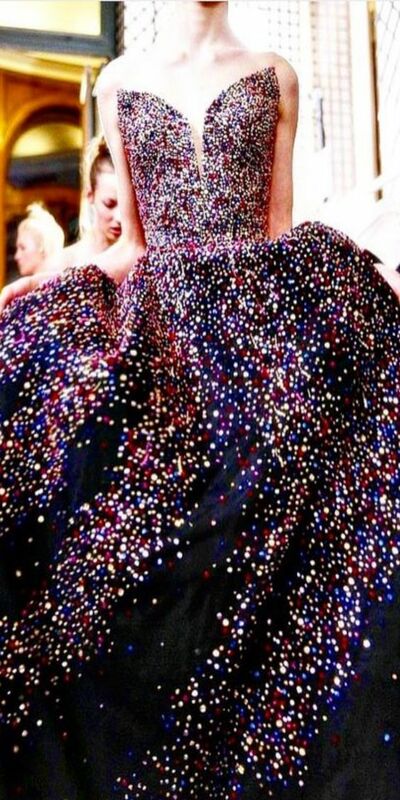 If there’s ever a night for sparkles, it’s prom night. If you love the glitter, tonight is the night to go all out and shine bright! If you’re going all out, this is the way to do it. The print on this gown is to die for and the boldness of the red against the white is just about as striking as it gets. Wear your hair up or down with this dress and you’re sure to have heads turning! The sparkly top and full, tiered skirt on this beautiful dress is extremely Cinderella-esk…after she makes her ball gown of course!